Data flow diagrams are categorized as either logical or physical. A logical data flow diagram focuses on the business and how the business operates. It is not concerned with how the system will be constructed. Instead, it describes the business events that take place and the data required and produced by each event. Conversely, a physical data flow diagram shows how the system will be implemented, including the hardware, software, files, and people involved in the system. The chart shown below contrasts the features of logical and physical models. Notice that the logical model reflects the business, whereas the physical model depicts the system. What the model depicts How the business operates. How the system will be implemented (or how the current system operates). What the processes represent Business activities. Programs, program modules, and manual procedures. What the data stores represent Collections of data regardless of how the data are stored. Physical files and databases, manual files. Type of data stores Show data stores representing permanent data collections. Master files, transition files. Any processes that operate at two different times must be connected by a data store. System controls Show business controls. Show controls for validating input data, for obtaining a record (record found status), for ensuring successful completion of a process, and for system security (example: journal records). Features common to both logical and physical data flow diagrams. Ideally, systems are developed by analyzing the current system (the current logical DFD) and then adding features that the new system should include (the proposed logical DFD). Finally, the best methods for implementing the new system should be developed (the physical DFD). This progression is shown in the figure illustrated below. Developing a logical data flow diagram for the current system affords a clear understanding of how the current system operates, and thus a good starting point for developing the logical model of the current system. This time-consuming step is often omitted so as to go straight to the proposed logical DFD. One argument in favor of taking the time to construct the logical data flow diagram of the current system is that it can be used to create the logical data flow diagram of the new system. Processes that will be unnecessary in the new system may be dropped, and new features, activities, output, input, and stored data may be added. This approach provides a means of ensuring that the essential features of the old system are retained in the new system. In addition, using the logical model for the current system as a basis for the proposed system provides for a gradual transition to the design of the new system. After the logical model for the new system has been developed, it may be used to create a physical data flow diagram for the new system. Figure illustrated below shows a logical data flow diagram and a physical data flow diagram for a grocery store cashier. The CUSTOMER brings the ITEMS to the register; PRICES for all ITEMS are LOOKED UP and then totaled; next, PAYMENT is given to the cashier; finally, the CUSTOMER is given a RECEIPT. The logical data flow diagram illustrates the processes involved without going into detail about the physical implementation of activities. The physical data flow diagram shows that a bar code—the universal product code (UPC) BAR CODE found on most grocery store items—is used. In addition, the physical data flow diagram mentions manual processes such as scanning, explains that a temporary file is used to keep a subtotal of items, and indicates that the PAYMENT could be made by CASH, CHECK, or DEBIT CARD. Finally, it refers to the receipt by its name, CASH REGISTER RECEIPT. 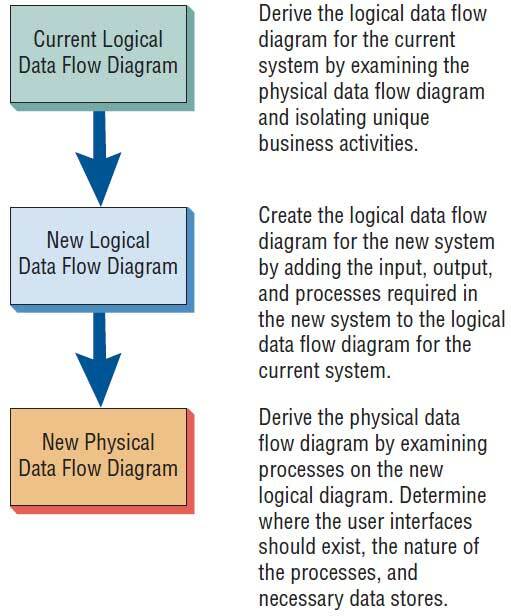 The physical data flow diagram (below) shows certain details not found on the logical data flow diagram (above). Better understanding of the business by analysts. Elimination of redundancies and easier creation of the physical model. A logical model is easier to use when communicating with users of the system because it is centered on business activities. Users will thus be familiar with the essential activities and many of the human information requirements of each activity. Systems formed using a logical data flow diagram are often more stable because they are based on business events and not on a particular technology or method of implementation. Logical data flow diagrams represent features of a system that would exist no matter what the physical means of doing business are. For example, activities such as applying for a video store membership card, checking out a DVD, and returning the DVD, would all occur whether the store had an automated, manual, or hybrid system.